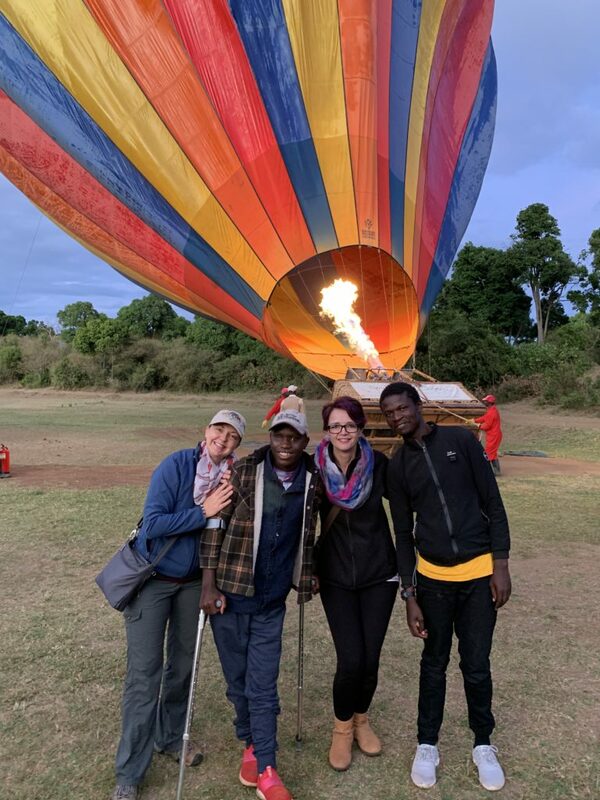 In April of 2018, Kathy and Michael met Franklin Signal, a 19-year old boy who was eagerly applying to be sponsored by Moja Tu so he could accomplish his dream of getting an education. After being abandoned as a child, he had already beaten the odds on several occasions and was an exemplary student…but he simply did not have the funds to pay for school. Kathy and Michael knew immediately that Franklin was exceptional, with a radiating smile and incredible determination to succeed. However, they quickly learned that his dream was being jeopardized by an unexplained but severe pain in his left leg. It was that exact moment, when Kathy and Michael agreed to support him—after sending him for a check-up—that changed everything. After several doctors’ visits, the diagnosis of stage 4 osteosarcoma was confirmed. After consulting with Franklin, Kathy and Michael decided to aggressively fight the cancer and the first step in the treatment was the amputation of Franklin’s left leg, followed by intense chemotherapy. Their hope was that the treatments would be successful and Franklin would then be able to fulfill his dream and continue his education. Treatment took a toll on Franklin’s body, but his spirit never wavered. He continued to share his smile and positivity with those around him, including several in the Moja Tu family who were following his story. While chemotherapy prevented him from enrolling in school, he provided math tutoring to several Moja Tu students throughout treatment, showing true dedication to their success and demonstrating once again what an exemplary person he is. Everyone’s hopes were shattered only weeks after completing treatment, however, when a stubborn cough led to a chest x-ray that then led to a CT scan. Heartbreakingly, in late October, our worst fears were confirmed—despite our aggressive attempts to fight the disease the cancer had spread and there were no more treatment options available for Franklin. Exactly 3 weeks later, Kathy and her sister, Erika, were on their way to Nairobi to make sure Franklin knew how much he was loved and to give him the diagnosis in person. 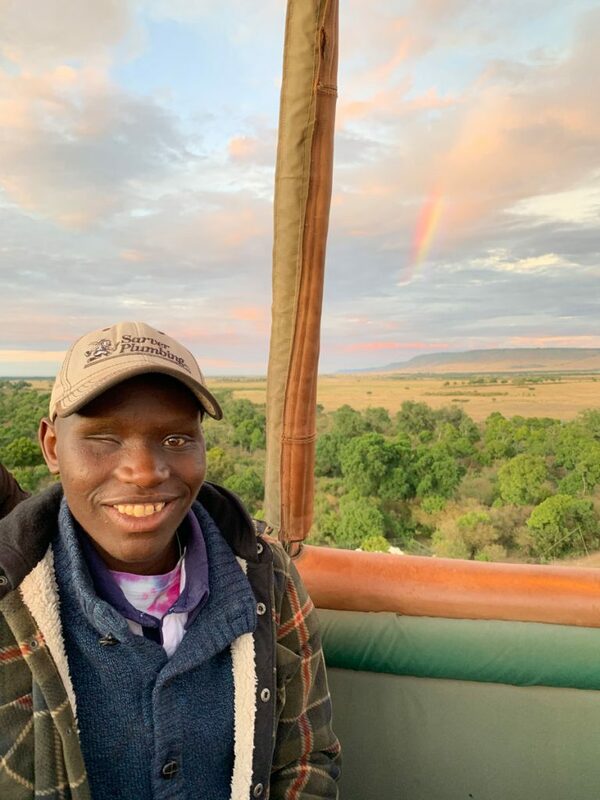 On their first day there - and in the midst of extremely difficult conversations - a rainbow appeared in the sky, providing encouragement and hope that they took with them to the Maasai Mara where Franklin's dreams of flying and having a cake with his name on it came true. His light was so bright during the trip...everyone around him could feel it. On the second day, Franklin got the chance to fly through the clouds in a hot air balloon, where another rainbow peaked through the clouds right as we were taking a picture of him. While a rainbow is simply an amalgamation of light that produces a beautiful combination colors—for many, it symbolizes hope. It was Maya Angelou who said to “be a rainbow in somebody else’s cloud”, and that is what came to mind at that very moment. We, among others, were there to be rainbows in Franklin’s clouds. The rainbow also represents spiritual cohesion, or unity, which is exactly what Franklin had done for us. His amazingly bright light has deeply touched those around him and has brought together hundreds of supporters all around the world. Unfortunately, just a couple of days after that hot air balloon ride, Franklin’s condition deteriorated and we had to check him into the hospital. He was visited there every day by his friends from the children's home where he grew up to keep his spirits high. Throughout this stay, Franklin wore his beautiful smile and expressed his hope to someday leave the hospital and go back to school. Nothing would have made us happier to see his wish come to pass, but sadly, Franklin passed away the evening of January 4th, 2019. He was surrounded by his loved ones and still wore his dazzling smile. We are eternally grateful to Franklin for sharing his light with us and now ask you to join us in ensuring that his light never fades. Moja Tu has created a fund in Franklin’s honor that will be dedicated to being the rainbow in other children’s lives. Franklin’s Rainbow Fund will help manage and support Moja Tu students achieve their dreams of getting an education by providing funds for ancillary expenses including medical, vision, hearing, counseling, school material, clothes, etc. We are honored to have 2 ambassadors for the fund, Patrick Wasike and Edwin Nyandieka, who helped care for Franklin throughout his treatment. After sharing the idea with Franklin (and getting his enthusiastic support! ), we are excited to launch Franklin’s Rainbow Fund. We want to show Franklin that his legacy will live on and that his light will continue to shine. To help us power Franklin's Rainbow, you can make donations through the link below, or send a check to 2900 W. Anderson Lane, C-200 #219, Austin, TX 78757. Help us Power Franklin’s Rainbow by showing your support by making a donation and sharing his story with others.